ISC programs offer a variety of academic experiences and challenges, including briefings with professionals and collaborative learning with peers. 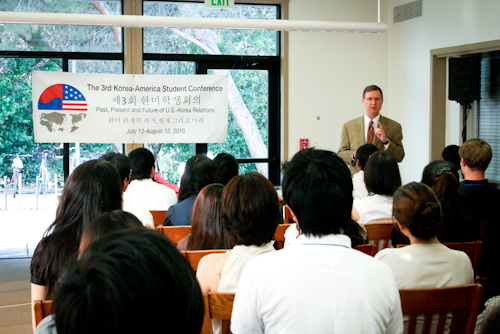 Once accepted into the Korea-America Student Conference (KASC) or Japan-America Student Conference (JASC), delegates should conduct independent research prior to the Conference to familiarize themselves with basic domestic and international issues facing both countries. Prior to the Conference, selected delegates will be asked to write a 5-page essay pertinent to the assigned topic. During the Conference, all delegates will share their essays and will actively contribute directly to a series of small group discussions called Roundtables. The small group format provides delegates a chance to explore the depth of issues and perspectives among peers from both countries. Delegates will also participate in an essay contest, and the best Roundtable essay winner will win a prize from ISC. Read more about KASC Roundtables and JASC Roundtables in 2013. Each participant is required to help build and share expertise among his or her Roundtable group by writing and presenting a research paper. Authored prior to the Conference, these papers will form the basis of the Roundtable discussions and brief other delegates on your topic of interest. At the end of the Conference, each Roundtable group will make a presentation of the table’s conclusions and findings at the Final Forum. In addition to research-related activities, delegates will have opportunities to participate directly in panel discussions, make speeches, and lead small group discussions as well as special projects. Although many participants are pursuing higher education related to Asia, all academic disciplines are welcome and each Conference is conducted in English.